As the weather heats up, we all spend more time outdoors. While there are benefits to soaking up the sun’s rays (We LOVE Vitamin D! ), it is more important than ever to take proper care to protect your skin from the potentially harmful effects of the sun. Here are 6 important ways to care for your skin before, during and after fun in the sun. Following these simple steps can help keep your skin beautiful all year long! Before spending time outdoors, apply sunscreen with full-spectrum UVA and UVB Protection. Facial skin is particularly sensitive so take advantage of facial moisturizers or foundations with SPF that can give you an added layer of protection. 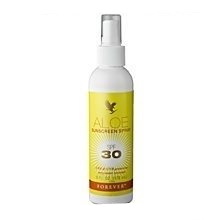 Aloe Sunscreen Spray With SPF 30 and the added benefits of Aloe Vera, water resistant Aloe Sunscreen Spray protects skin from the damaging effects of the sun with an easy, convenient spray application. The sun’s rays can be especially drying to the tissues of your lips. Make sure to apply a lip balm with SPF to protect lips from drying, peeling andcracking. Preventative care is important! Planning effectively can help keep you from having to treat an uncomfortable or painful burn, or rough,chapped lips. 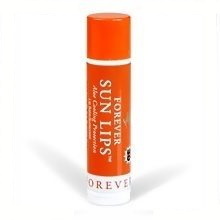 Forever Sun Lips protect and relieve chapped or cracked lips with this soothing Aloe-based lip balm. Water resistant with SPF 30, Forever Sun Lips is the perfect summer companion. There are so many benefits to drinking 8 glasses of water a day. Being well hydrated helps curb cravings, fight infections, flush toxins from the body and support healthy skin. Skin contains water, and when it is dehydrated the skin is more susceptible to appearing dry and wrinkled. Don’t wait until you’re thirsty – by then you’re already on your way to dehydration. Instead, make drinking water part of your outdoor summer routine! Refresh and renew with natural spring water. Fresh, pure, natural spring water bottled straight from the source of bubbling springs. Unlike some bottled waters, Forever Natural Spring Water does not have to be transported for long distances to a bottling plant miles away. This helps insure its freshness and purity, so it comes to you just like if came from the spring. Even with all of our best intentions, sometimes sunburns happen. Apply Aloe Vera to the skin to sooth, cool and rehydrate red and irritated skin. Keeping the skin moisturized can help burns heal faster and delay or prevent painful peeling. Tip: keep your Aloe Vera in the fridge for a cool sensation to instantly take the sting out of burns! Aloe Vera Gelly is as close to cutting open an Aloe Vera leaf as you can get! Our 100% Aloe Vera gel hydrates and soothes sensitive tissues for immediate relief. Uneven skin tone can happen after pregnancy, time in the sun or as we age. Thankfully, these spots don’t need to be permanent! Apply a spotevening formula to brighten the complexion and improve the appearance of dark spots. Regular exfoliation can also help to keep your skin tone bright and even. 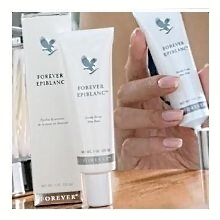 Forever Epiblanc's exclusive formula is specifically designed to brighten the complexion and even skin tone while helping to diminish the appearance of dark spots. Gently evens skin tone. Brightens the complexion. Diminishes appearance of dark spots. SPF (which stands for Sun Protection Factor) indicates how much longer you can stay in the sun without protection. For example, SPF 30 allows you to stay in the sun 30 times longer without burning than you could without sun protection! Still, make sure to reapply sunscreen often.